Map of Africa, Showing its most Recent Discoveries. 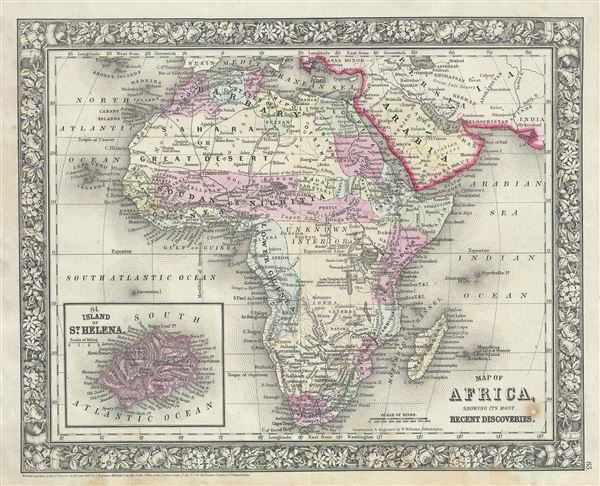 This is a beautiful example of S. A. Mitchell Jr.'s 1866 map of Africa and St. Helena. It covers the continent in considerable detail considering the level to which it was explored at the time. One of the early Mitchell series to depict Lake Victoria, the existence of which was only confirmed by Stanley in 1862. Though the copyright was not updated, presumably Mitchell must have altered the plate sometime in 1863 to reflect the discovery of Victoria. Also notes the outflow of Ripon Falls, the source of the Nile. European colonies and outposts dot the coastlines and the great Arab caravan routes across the Sahara are noted. Inset in the lower left quadrant features the remote island of St. Helena. Color coded with red, green, and yellow pastels according to political divisions. The whole is surrounded by the attractive floral border common to Mitchell atlases between 1860 and 1866. Very good. Minor toning and foxing at places. Rumsey 0565.043 (1860 edition). Phillips (Atlases) 831-16. New York Public Library, Map Division, 1510838.